It’s the season for entertaining and holiday parties. You’re looking forward to having friends over and spending time with family, but you aren’t looking forward to the stains they will probably leave on the carpet. You don’t want to ruin the festivities by panicking about the possibility of stains on the carpet. Here are a few tips for dealing with the crowds and keeping your carpet looking incredible. It’s easier to deal with stains if you can clearly see where they are. Before the party, have your carpets professionally cleaned. The house will look fantastic for your guests, and you will be able to invite people in with confidence. After the party, any stains will stand out and be easier for you to spot and treat. If parties get a little too crowded, then accidents become more likely. Perhaps someone dropped a tube of lipstick and it rubbed across the carpet, or maybe someone fell by accident. Either way, you need to get the lipstick out to avoid staining. Blot it dry with a clean paper towel, and then blot it with a dry-cleaning solution. Rinse the solution out using a mixture of one-tablespoon ammonia and a cup of water. Goo Gone applied to a clean paper towel can be used to blot up the lipstick, or you can try a little rubbing alcohol. 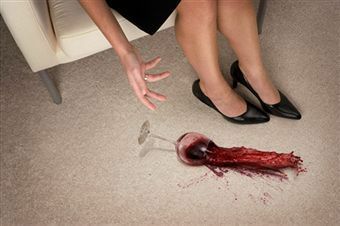 The most common stain after a party, red wine can be difficult to remove. If you are informed when it happens, start by blotting the stain with a clean cloth. Mix a tablespoon of dish soap with one cup of hydrogen peroxide and soak a sponge in the solution. Squeeze half the solution out of the sponge and then blot at the stain to lift it from the carpet fibers. Once the wine is removed, rinse the area with warm water and then blot dry. This will also work after the wine has dried, but the process will take longer and the stain may not lift out completely. The fresh candles create a wonderful smell, and your guests will love the soft glow they cast against the walls. However, it is too easy for a bumped candle to splatter wax on your carpet. Getting it up isn’t very difficult, but you will have to be careful. It’s easier to remove once it’s dry, so leave it until the next day. Start by scraping off as much as you can with a butter knife. Lay paper towels on the remaining wax. Press an iron set on low to medium heat over the paper towels to melt the wax and let the towel absorb it. You will use several towels in the process, and you will have to keep the iron moving to avoid burning your carpet. It’s a good idea to have the carpets cleaned again after the party. Any dirt that was tracked in will not have time to be ground into the carpet and form permanent stains. Contact the professionals at High Quality Carpet to have your carpets cleaned and restored after the final holiday party.